Despite an alleged police attack in which one indigenous protester was shot dead and multiple were injured, indigenous organizations resumed negotiations with the government in southwest Colombia. The police, allegedly accompanied by the military and armed civilians, attacked a protest camp in Cajibio, Cauca, miles south of Santander de Quilichao where the meeting was supposed to be held. The attack ended around 11AM after which talks between Peace Commissioner Miguel Ceballos and the ONIC resumed in Dagua, Valle del Cauca, while talks between Interior Minister Nancy Patricia Gutierrez and the CRIC resumed in Santander de Quilichao. The meetings were accompanied by representatives of the United Nations and the Organization of American States and reportedly tense because of the outbreak of violence. Four weeks of tensions in the face of 542 years of marginalization, slavery, abandonment and neglect are nothing, not just to stand for our rights, but also for the guarantee to life for all Colombians. The indigenous were forced to delay their original demands in regards to access to land, healthcare and education. 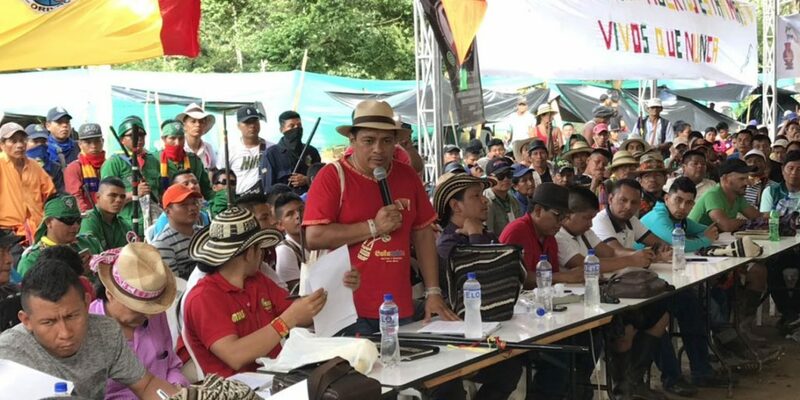 Instead, the ONIC’s representatives demanded that the national government end the killing of protesters, and stop the stigmatization and criminalization of the “minga,” the indigenous mobilization. According to the ONIC, its call for action has received the support of more than 326 social organizations and 30 congressmen. Indigenous peoples from the provinces of Nariño, Tolima, Choco, Antioquia, Huila, Meta, Caqueta, Putumayo, Norte de Santander and Boyaca have joined the protests initially only held in Cauca. Afrocolombian and peasant organizations have also expressed their support for the protests and rejected Thursday’s violence against the indigenous.